Twizzle, the unit n. 669 of the famous Dutch Feadship shipyard, is the synthesis of classical Feadship features and formal innovation. Classification: Lloyds 100°1 SSC, Yacht, Mono, G6, LMC, UMS in compliance with MCA rules for commercial ships. For further information contact: Feadship Holland; Zijlweg 148C; P.O. Box 5238; 2000 GE Haarlem - The Netherlands; tel. 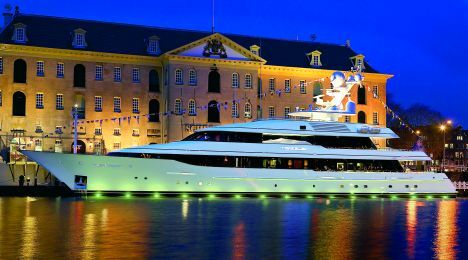 +31 (0) 23 524 70 00; fax +31 (0) 23 524 86 39; website: www.feadship.nl; e-mail: info@feadship.nl. De Voogt Naval Architects and De Vries designed this motoryacht hand in hand with her Owner. Twizzle is the nickname of the Owner's son as a child; this denotes the vessel's strong link with the personal experience of the Owner's family and it highlights their intimate relationship. The interior layout was designed as a real 'home by the sea' fraught with high-tech solutions yet offering maximum comfort. Once inside, what we first notice, in addition to the above-mentioned, is that she offers accommodation for ten among guests and Owner and for fourteen crewmembers. 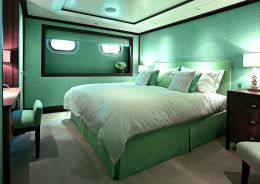 This points out to the fact that the yacht was conceived to offer maximum comfort. Twizzle, as all other yachts built by the Dutch yard, is a concentration of state-of-the-art technological solutions applied to plants and to the construction systems of hull and superstructures. Just to make an example, every smallest technical detail was optimized to such an extent that Twizzle is considered 'to have more technical systems than a military frigate'. It seems hardly probable, even though if such declaration was made it means that the yacht abounds with technology. On the other hand it is in the yard's tradition to invest in advanced technology to deploy high tech solutions in order to turn every unit a modern yacht as for design and contents. This may be easily confirmed by the wheelhouse - with seven touch screens, two electronic chart tables and a very modern console - that may be easily compared with that of a ship destined to more complex operations than simple long-range cruises. The two designers worked hard and hand in hand with the Owner to look for the right balance between shape and contents, where shape is represented by the interior and exterior layouts and contents by functionality and safety. An example of this is the huge fold-in plasma screen, operated by a simple push-button mechanism, concealed when not in use by a large Mirò painting, inside the main bridge deck lounge, whose different layout solutions offer an original and cozy area. 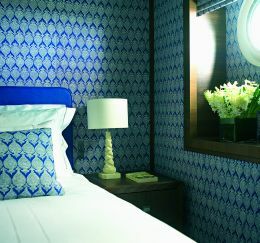 The interior was developed by the Owner in association with the designer Redman Whitely Dixon while the decoration was created by the London-based group Todhunter Earle Group, among the world leaders in interior design of deluxe hotels and residences. Sally Storey contributed to Twizzle's lighting arrangements which requested special care for the Owner had a clear idea of what he wanted: every line and every shape had to appear as the client had imagined. Actually, the architects and the designers dedicated themselves to translating into reality the Owner's idea rather than looking for new solutions to create something innovative. In practice, the ideas were clear in the Owner's mind but technical solutions were to be looked for to translate them into reality. 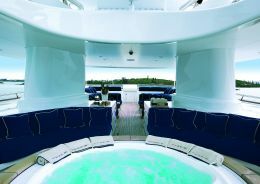 Even though the resulting yacht represent what the Owner had imagined beforehand, she faithfully reflects the yard's philosophy, that is to say, everything is very modern but at the same time very comfortable. For interior decoration several antique pieces of furniture were used, in particular wall-fixed lamps and fashionable American design objects, yet most hardware was custom made for Twizzle so that each space is unique and highly sophisticated. Much attention was paid to the delicate color combinations of upholstery, which do not shock the observer's eye rather they guide his sight to the most important decorating elements, such as a masterpiece. The main lounge ideally continues in the dining room: even if the two spaces are actually separate they are connected by means of a wide hallway from which one may enjoy the sumptuousness of this deck. 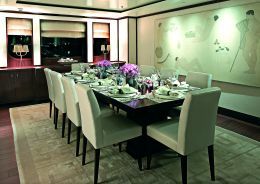 The designers worked hard to obtain a snug dining room which could offer privacy without being isolated. Another special feature of the main deck is the presence of an area dedicated to the interaction with the chef. Near the galley there is a space where the Owner and his guests may enjoy culinary demonstrations and taste gourmet delicacies which so much attract the Owner. The master suite is reached from the main lobby through the study, which serves as entrance and features a desk, a sofa and surrounding bookcases. The Owner's bedroom was made according to precise indications that turn it particularly cozy and elegant, with coffee-colored silk upholstery and soft colors that combine with decorating elements so as to render the environment snug and high-class. 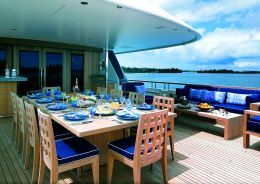 In the aft area of the main deck there are: a table that seats eleven, several settees and numerous armchairs for relaxed lounging combined and plenty of elements that make this area a real terrace on the sea and directly connected with the aft platform. The lower deck is accessible through the stairway existing in the main lounge, decorated with strikingly beautiful opaque glass. Each guest cabin is unique but all have in common the elegance and extreme sophistication of color combinations and elements. They are called according to the color that distinguishes them, such as guest yellow, guest blue, guest aqua and guest green. Each one has en suite bathroom and a flatscreen TV, which doubles as a mirror when not in use. Commercially not available, such mirrors were expressly created for Twizzle like many other accessories. Useless to say that so much sophistication cannot disappoint as for playthings to carry along. Inside the lazarette there are two Laser sailboats and two kayaks in their appropriate seats, a diving compressor for diving tanks and a wide range of sport equipment. 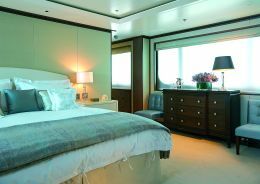 The crew quarters, as we mentioned above, are ideally conceived for fourteen crewmembers. 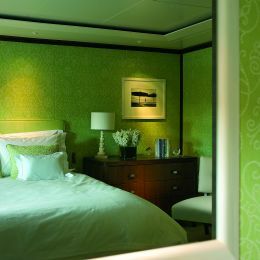 There are six comfortable cabins that are independent from the rest of the yacht for guests' privacy. The bridge deck, is accessed from the main deck via the central stairway. This deck is perfectly in style and is decorated with painstaking care. It includes a dual entertainment area, an informal saloon for relaxed lunching and lounging and two seating areas with comfortable and ample settees and coffee tables. These spaces are inside an ample structure that with its streamlined shape does not weigh down on the exterior profile. The sundeck is the ideal place for sunbathing in utmost privacy. Here again several aesthetic and functional elements turn this area pleasant and cozy. 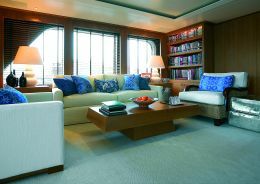 Undoubtedly, it is not easy to describe a yacht like Twizzle, for there are several features that are worth describing. For obvious reasons of space we limit ourselves to this brief description, but in future issues we shall try to explain more in detail the numerous technical solutions.